The University of Saskatchewan has always played host to bright minds—some of them are just younger than others. The Academic Research/ Work Placement Program is an initiative between the Saskatoon Public School Division (SPSD) and several organizations in Saskatoon, including the U of S. A number of colleges participate in the program, which aims to place Grade 12 students in an area they are hoping to pursue after high school. The variety of programs for students to participate in is wide, from health sciences and engineering to law and the social sciences. 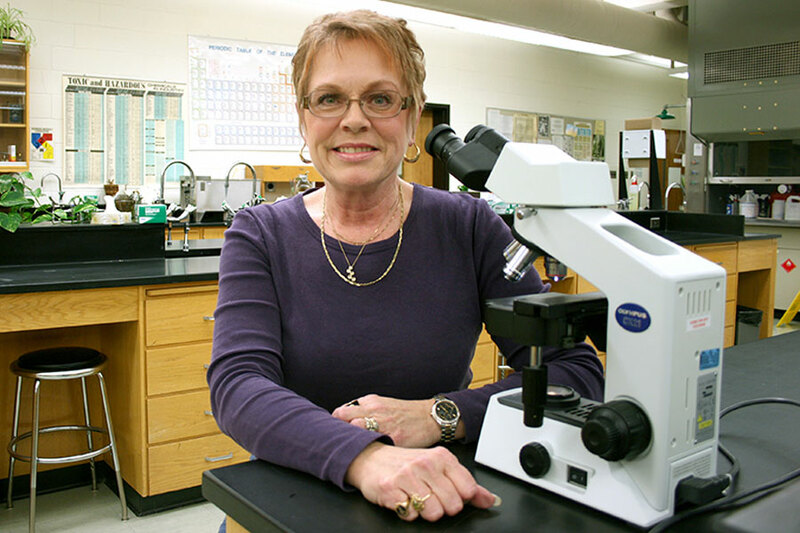 Over the course of 10 weeks, students from participating schools come to campus to work alongside faculty, staff and researchers for two hours a day, explained Marlene Flaman Dunn, career education co-ordinator for SPSD. "In their senior year, we like to get them on campus, in the area of their interest, where they get a chance to talk to people in the field—professors, researchers, grad students, undergrad students—and they get a feel for what may be in store for them," she said. Many of the students have completed the required senior-level courses well ahead of time and are facing spare periods in their schedule. "They have room in their timetable and they want to have something that's challenging for them." More than 200 high achievers have participated in the program since its launch 12 years ago. In addition to getting hands-on experience and a taste of the real world, students earn credit for their grade 12 career and work education class. One of the most sought after placements at the U of S, according to Flaman Dunn, is in the Western College of Veterinary Medicine (WCVM); since 2003, 31 students have completed placements in the college. Cathy Coghlin is a research technician in the Department of Veterinary Biomedical Sciences at WCVM and also co-ordinates the placement program for the college. She strives to give the students a well-rounded experience over their placement period, which can include classroom, lab and clinical work. By doing so, she hopes to expose them to the academic environment awaiting them if they pursue veterinary studies. "When I was in school, to be a vet was to play with puppies and kitties. I had no clue what was involved in becoming a vet," she said with a laugh. "It's a total immersion for them to understand what's expected of them, and what they are going to have to learn in order to become a DVM (doctor of veterinary medicine)." The students participate in everything from lectures and assisting with lab set-up, to learning proper animal handling techniques and assisting with clinical procedures, she said. "They're seeing how it all ties in. You see the lightbulbs going off." And faculty members in the college are keen to mentor and work directly with students in the lab and clinical environments. " They get to see radiographs being done, they get to see ultrasounds being done," said Coghlin. "If there's an MRI being done that day, they don't necessarily go right in but they can see what MRI scans look like that the vets look at to determine a diagnosis." The program may also ease the sometimes-rocky transition from high school to university, a struggle for many students, said Flaman Dunn. If they know what is expected of them academically and apply themselves, they are more likely to be successful in their studies, she added. Students apply to participate directly to the school division. is involves submitting recent transcripts, a questionnaire explaining why they want to take the program and two reference letters from teachers who can vouch for their academic ability as well at their level of maturity. In the academic placements on campus, students are typically paired with a researcher or graduate student. There is usually a short period of time to allow the students to familiarize themselves with the subject, and once they do they fit in well, said Coghlin. A few have even had their names listed as a researcher in an academic journal article before they are offcially a university student. Hands-on experiences such as these are invaluable, said Flaman Dunn, for both student engagement and career exposure. "It is paramount to expose them to a potential career path. I would much rather see those students engaged in higher areas of learning than taking spares."